I would like to think I am a dab hand at keeping my little two up, two down, Belfast sanctuary spick & span. I’ve been known on many occasion to utter the words ‘honestly, I couldn’t cope with that mess, I think I’ve OCD’! In my own little bubble I genuinely did believe this… right up until one morning in February 2015. This particular morning (distressingly before I had consumed my 2 double strength Douwe Egberts traditional blend coffees) I spent 30 minutes showing two members of the Northern Ireland Hotels Federation around Tara Lodge on a surprise inspection of our hotel bedrooms. They picked three rooms at random and inspected the common areas throughout the property. I needn’t have worried one iota. 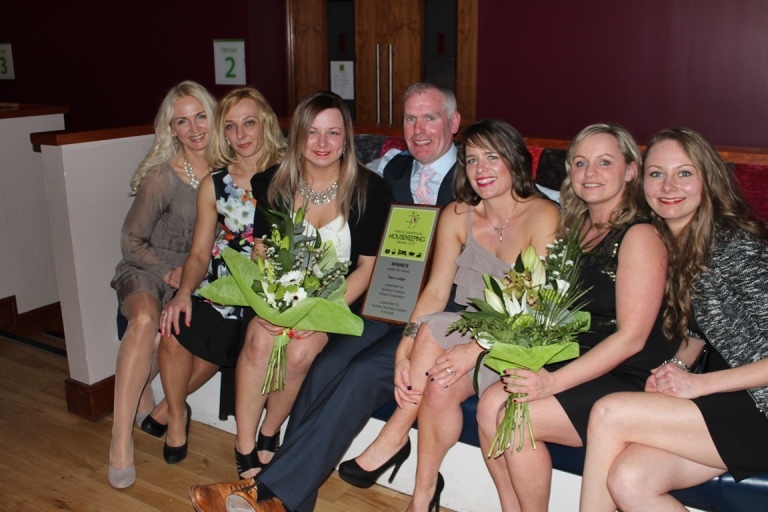 The result of this ‘clean sweep’ of an inspection was that our girls; Reda, Audrone, Ernesta, Adriana and Edyta (pictured up top with owner Conor O’Donnell and General Manager Nora Douds), won NIHF Housekeeping Team of the Year 2015, in the under 90 rooms category, for no less than the 3rd time in four years! They received this well-deserved accolade at the prestigious Gala Dinner on Wednesday 25thMarch at the Holiday Inn, Belfast on Wednesday 25 March 2015. 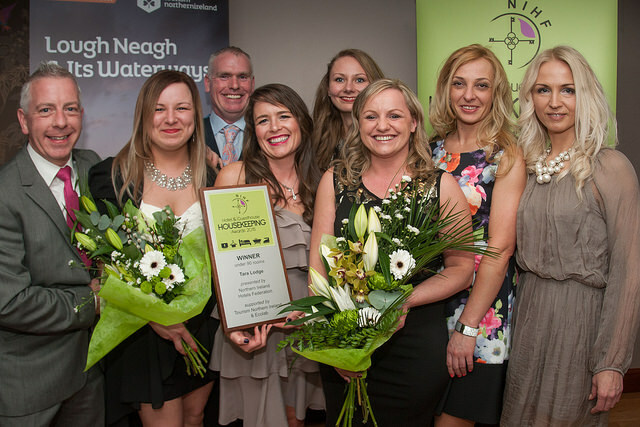 The NIHF Housekeeping awards, which are now in their sixth year, are fiercely competitive within the Northern Ireland accommodation sector. The competition begins with an off-site assessment day designed to be fun and educational. Fellow finalists Galgorm Resort & Spa, Salty Dog Hotel & Bistro and fellow winners Belmore Court & Motel offered strong competition this year. ‘Our Girls’ are the backbone of everything we do at Tara Lodge; an elegant 34 bedroom, four star, boutique hotel in the heart of the super trendy Queens Quarter of South Belfast. Our exquisitely decorated hotel bedrooms are displayed to their very finest every time a new guest walks through the door. The reason behind this? The pride Ernesta and her team bring to work each day. Immensely self-critical, to a fault, there is not one member of the team who is not 100% invested in doing the best job possible, every day. They are all the best of friends and support each other fully in all aspects of their essential roles. The results delivered by the tight knit team are clearly evident to colleagues, industry professionals and to our guests in particular. Our wonderful team and guest reviews have consistently kept us at the top spot for many years, making everything we do, in all departments of our little gem of a hotel so very worthwhile. If you speak to any member of the Tara Lodge team, we will confirm hand on heart, that we all love coming to work! We are so unbelievably proud of our housekeeping team and want to say the biggest thank you to them for everything they do!